The Publisher Says: It all began thirty years ago on Mars, with a greenperson. But by the time it all finished, the town of Desolation Road had experienced every conceivable abnormality from Adam Black's Wonderful Travelling Chautauqua and Educational 'Stravaganza (complete with its very own captive angel) to the Astounding Tatterdemalion Air Bazaar. Its inhabitants ranged from Dr. Alimantando, the town's founder and resident genius, to the Babooshka, a barren grandmother who just wants her own child-grown in a fruit jar; from Rajendra Das, mechanical hobo who has a mystical way with machines to the Gallacelli brothers, identical triplets who fell in love with-and married-the same woman. My Review: Earth can't sustain its current population in the style to which all 7 billion of us wish to become accustomed, and no one is predicting a sudden outbreak of common sense and birth prevention to bring the numbers down. What are we to do? Move, of course. Where? More than one place. There's the Metropolis, the geosynchronous city in space reached by fixed space elevators; but that's filling up too; wherever shall we go? Well, Mars, for one. The Remote Orbital Terraforming and Environmental Control Headquarters (ROTECH for short) consortium is created on the Motherworld, sent into a moonbelt orbit around Mars, and given a thousand years of development, has finally produced a planetary ecosystem that can sustain unsuited humans in the open. ROTECH governs Mars as lightly as any frontier is governed. People, let loose from cities and rules, pretty much do what comes naturally. They have babies, they make farms, they organize themselves into Us and Them, and they do it all at breakneck speed without worrying too hard about consequences. When Consequences rain down from the Heavens, well, adapt or die. 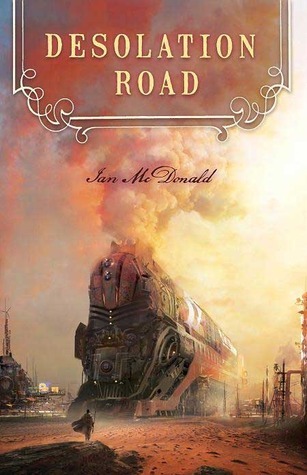 Ian McDonald does in 363 pages what others do in 1000. He makes Mars come alive, he peoples it with fabulous characters (human and cyborg and robotic), he creates a logical thought experiment...how can humanity survive its inevitable wearing out of the Motherworld?...and uses it to tell us about ourselves, about what we are *actually* made of, and about what triumphs and tragedies flow naturally and inevitably from that. No, really, that's it. I adore this book. You should read it, especially if you point your booger-holder at the sky when science fiction is mentioned. I don't read THAT people should read this. If you don't, then you should be ashamed of your inflexibility. I even re-read Jane Austen recently. And liked it. So. What's that “I don't like THAT” stuff again? I just picked this one up the other day, so it looks like it's making its way up the pile a bit faster now. Thanks.